The particular webpage comes from an email I received from John Taubeneck, and of whom has assisted me on the research of the double ended wreckers that operated in the New York Area. "I notice that you don't mention the railroad at Fort Wood on Bedlow's[sic] Island. The Army ran at least one Bell gasoline locomotive there during World War I. See http://www.gearedsteam.com/bell/bell.htm . Bell built small steam and gasoline locomotives in New York from 1908 to about 1920." So, with utmost gratitude to John Taubenck for enlightening me to my oversight of this location, I have now have created this page for Fort Wood! On 15 February 1800, the Legislature of the State of New York State ceded Bedloe's Island to the United States government. The reason for this was for the construction of a defensive fort to be constructed there in association with forts on Governor's Island and Ellis Island. Construction of a land based artillery battery began in 1806 and was completed in 1811. The fortifications were constructed of granite, and were constructed in a star shape with eleven bastions. Following the War of 1812, the fort on Bedloe's Island was named Fort Wood in honor of Lieutenant Colonel Eleazer Derby Wood, of whom was killed in 1813 at the Battle of Lake Erie. Ironically, this fort construction survives, and became the part of the base for the Statue of Liberty! Fort Wood: 1811, Statue of Liberty, Bedloe's Island. In 1811 an 11 pointed star-shaped battery with 30 guns was completed. Named Fort Wood (for Lt. Col Elenzer Wood battle of Lake Erie) in 1814. 1861 used for 100 sick Confederate Prisoners of War from Castle Williams, later moved to Fort Warren in Boston harbor. 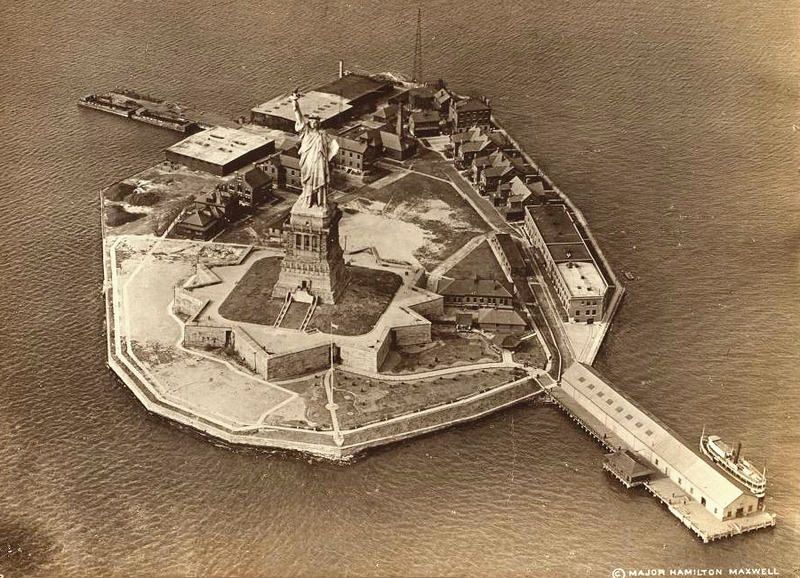 By 1877 the island was under consideration for the Statue of Liberty and a garrison post had been built around the original fort. The island was selected and the pedestal completed within the fort by April 1886 and the statue installed thereafter. Taken over for maintenance by the War Department in 1902. The National Park Service was formed in 1916 and took over operations in 1933 of two acres while the Army kept 10 acres. The NPS took total control in 1937 and the Army began to close the fort through December 1944. The garrison post buildings of Fort Wood were torn down from 1948 to 1950. "During World War I, the Bell Company built a few small gasoline driven engines. Probably the one which was seen by the greatest number of people was a dinkey which the Army bought for use at Fort Wood, New York Harbor. It was operated, all through the conflict, on Bedloe's Island, where the Statue of Liberty stands. I well remember the man who came to the office to place the order. He had an accent German enough for the Kaiser, himself. When Mr. Bell asked him what the steepest grade on the line would be, he held up his arms to indicate a slope of nearly 45 degrees and said "about like dot." As I recall, the actual measurement was somewhere between four and five degrees, but for some reason it did look almost as bad as he had indicated. One of the remarkable things about this little locomotive was that while it represented Bell's first experience with gasoline powered dinkies, the job was ordered, designed and built, in exactly ten days. Today the steam dinkey business is just about chuffing its last. Gasoline and Diesel engines have usurped the place the little kettles once occupied. But during their hey-day, Bell locomotives did their proud share of the world's work and it is pleasant for me to recall my experiences with them." The Geared Steam website can be viewed here: Bell Geared Steam Locomotives. .
On a whim, I decided to check the New York Public Library Digital Archives for images of Bedloe's Island. I was not to be disappointed. 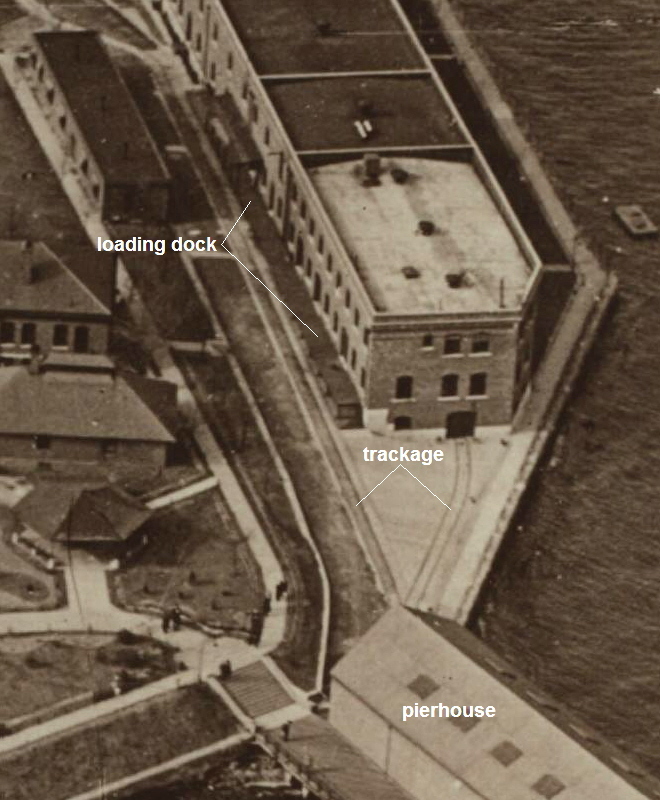 In one undated aerial image, a short run of trackage leading from the pierhouse to one of the buildings and a loading dock alongside that building can clearly be seen! It now appears that the "railway" was nothing more than a means to transport goods from the piershed to one of the buildings. By zooming out, and looking at an image of the entire island, including the Statue of Liberty, shows the true shortness of the railway. In referencing the height of the Statue of Liberty which is given as 305 feet (ground to tip of torch). It appears by the time of this photo was taken, the Fort Wood Railway is not much much longer! Unfortunately, nothing remains of the Fort Wood Railway.